[S61] 1930 United States Federal Census, online , Year: 1930; Census Place: Auburn, Cayuga, New York; Roll: 1410; Page: 8A; Enumeration District: 1; Image: 882.0; FHL microfilm: 2341145. [S11] 1910 United States Federal Census, online , Year: 1910; Census Place: Auburn Ward 10, Cayuga, New York; Roll: T624_928; Page: 9A; Enumeration District: 0030; Image: 763; FHL microfilm: 1374941. [S69] 1940 United States Federal Census, online , Year: 1940; Census Place: Auburn, Cayuga, New York; Roll: T627_2507; Page: 3A; Enumeration District: 6-34. Michael Fox was born circa 1834 at New York, USA.2 He was born in May 1834 at New York, USA.3,4 He was born circa 1835 at New York, USA.1 He married Charlotte H Rhodes, daughter of Dexter Rhoades and Catharine Ann Valentine, in 1856.3 Michael Fox lived in 1860 at Tyre, Seneca, New York, USA.2 He lived in 1880 at Montezuma, Cayuga, New York, USA.1 He lived in 1892 at Montezuma, Cayuga, New York, USA; Age: 57.4 He lived in 1900 at Montezuma, Cayuga, New York, USA.3 He died on 2 November 1908 at Montezuma, Cayuga, New York, USA, at age 74. [S2] 1880 United States Federal Census, online , Year: 1880; Census Place: Montezuma, Cayuga, New York; Roll: 814; Family History Film: 1254814; Page: 190C; Enumeration District: 029; Image: 0302. [S9] Ancestry.com, 1860 United States Federal Census (n.p. : Online publication - Provo, UT, USA: Ancestry.com Operations, Inc., 2009. Images reproduced by FamilySearch.Original data - 1860 U.S. census, population schedule. NARA microfilm publication M653, 1,438 rolls. Washington, D.C.: National Archives and Records, unknown publish date), Year: 1860; Census Place: Tyre, Seneca, New York; Roll: ; Page: 160; Image: 164. [S26] 1900 United States Federal Census, online , Year: 1900; Census Place: Montezuma, Cayuga, New York; Roll: T623_1013; Page: 6B; Enumeration District: 34; FHL microfilm: 1241013. Source Citation: Year: 1900; Census Place: De Witt, Onondaga, New York; Roll: 1134; Page: 13A; Enumeration District: 0045; FHL microfilm: 1241134. [S85] Montezuma Birth Records, online <http://web.archive.org/web/20001110085900/http://…>, Fox, (f) Apr 14, 1885 Montezuma Sarah Whaley (17) Marcestishire Eng George Fox (28) Laborer Tyre NY. [S85] Montezuma Birth Records, online <http://web.archive.org/web/20001110085900/http://…>, Fox, Ethel (f) Dec 31, 1887 1-0 Montezuma Sarah P. Whaley (20) England George Fox (31) Labour Tyre NY. [S85] Montezuma Birth Records, online <http://web.archive.org/web/20001110085900/http://…>, Fox, Harold E. (m) Jan 6, 1894 3-2 Montezuma Sarah P. Whaley (26) England George W. Fox Tyre NY. [S85] Montezuma Birth Records, online <http://web.archive.org/web/20001110085900/http://…>, Fox, Norman B. (m) April 12, 1897 Montezuma Sarah P. Whaley (29) Worcester Eng George Fox (40) Laborer Mays Point. Notes: 13 May 1983: Name listed as DOROTHY FOX TSCHUME; 09 Dec 1989: Name listed as DOROTHY F TSCHUME. [S6] Ancestry.com, 1850 United States Federal Census (n.p. : Online publication - Provo, UT, USA: Ancestry.com Operations, Inc., 2009. Images reproduced by FamilySearch.Original data - Seventh Census of the United States, 1850; (National Archives Microfilm Publication M432, 1009 rolls); Records of the Bureau of the, unknown publish date), Year: 1850; Census Place: Tyre, Seneca, New York; Roll: M432_597; Page: 249B; Image: . [S26] 1900 United States Federal Census, online , Year: 1900; Census Place: Arcadia, Wayne, New York; Roll: 1173; Page: 17A; Enumeration District: 0106; FHL microfilm: 1241173. [S11] 1910 United States Federal Census, online , Year: 1910; Census Place: Auburn Ward 4, Cayuga, New York; Roll: T624_928; Page: 2A; Enumeration District: 0011; FHL microfilm: 1374941. [S61] 1930 United States Federal Census, online , Year: 1930; Census Place: Aurelius, Cayuga, New York; Roll: 1411; Page: 1B; Enumeration District: 24; Image: 589.0; FHL microfilm: 2341146. [S66] 1925 New York, State Census, online , New York State Archives; Albany, New York; State Population Census Schedules, 1925; Election District: 03; Assembly District: 01; City: Auburn Ward 09; County: Cayuga; Page: 7. [S961] Ancestry.com, 1851 England Census (n.p. : Online publication - Provo, UT, USA: Ancestry.com Operations Inc, 2005.Original data - Census Returns of England and Wales, 1851. Kew, Surrey, England: The National Archives of the UK (TNA): Public Record Office (PRO), 1851. Data imaged from the National A, unknown publish date), Class: HO107; Piece: 1764; Folio: 730; Page: 32; GSU roll: 193656-193657. John Denniss was born circa 1842 at Littleport, Cambridgeshire, England.2 He was born in February 1845 at Littleport, Cambridgeshire, England.1,3,4,5,6 He lived in 1851 at Littleport, Cambridgeshire, England.1 He married Mary Ann Leggett in 1871.3 John Denniss immigrated in 1878.4 He lived in 1881 at Camberwell, London, England; Age: 37Relation: Head; Condition as to marriage: Married.5 He immigrated in 1882.3 He immigrated in 1889.6 He immigrated in 1890.2 He lived in 1900 at Auburn, Cayuga, New York, USA.3 He lived in 1910 at Auburn Ward 6, Cayuga, New York, USA; Age in 1910: 65Marital Status: Married; Relation to Head of House: Self; Relation to Head of House: Head.6 He lived in 1920 at Auburn Ward 6, Cayuga, New York, USA.4 He lived in 1930 at Auburn, Cayuga, New York, USA.2 He died on 16 July 1936 at Auburn, Cayuga, New York, USA, at age 91. [S61] 1930 United States Federal Census, online , Year: 1930; Census Place: Auburn, Cayuga, New York; Roll: 1411; Page: 9A; Enumeration District: 11; Image: 164.0; FHL microfilm: 2341146. [S26] 1900 United States Federal Census, online , Year: 1900; Census Place: Auburn Ward 5, Cayuga, New York; Roll: T623_1012; Page: 7B; Enumeration District: 11; FHL microfilm: 1241012. [S65] 1920 United States Federal Census, online , Year: 1920; Census Place: Auburn Ward 6, Cayuga, New York; Roll: T625_1089; Page: 9A; Enumeration District: 10; Image: 389. [S794] 1881 England Census Ancestry.com and The Church of Jesus Christ of Latter-day Saints. 1881 England Census [database on-line]. Provo, UT, USA: Ancestry.com Operations Inc, 2004. 1881 British Isles Census Index provided by The Church of Jesus Christ of Latter-day Saints Â© Copyr,, Class: RG11; Piece: 691; Folio: 55; Page: 24; GSU roll: 1341160. [S11] 1910 United States Federal Census, online , Year: 1910; Census Place: Auburn Ward 6, Cayuga, New York; Roll: T624_928; Page: 4A; Enumeration District: 0019; FHL microfilm: 1374941. [S61] 1930 United States Federal Census, online , Year: 1930; Census Place: Auburn, Cayuga, New York; Roll: 1411; Page: 19B; Enumeration District: 11; Image: 185.0; FHL microfilm: 2341146. [S69] 1940 United States Federal Census, online , Year: 1940; Census Place: Auburn, Cayuga, New York; Roll: T627_2507; Page: 10A; Enumeration District: 6-19. [S61] 1930 United States Federal Census, online , Year: 1930; Census Place: Auburn, Cayuga, New York; Roll: 1411; Page: 12B; Enumeration District: 11; Image: 171.0; FHL microfilm: 2341146. [S65] 1920 United States Federal Census, online , Year: 1920; Census Place: Auburn Ward 6, Cayuga, New York; Roll: T625_1089; Page: 6B; Enumeration District: 10; Image: 384. George Henry Denniss married Mae (?) 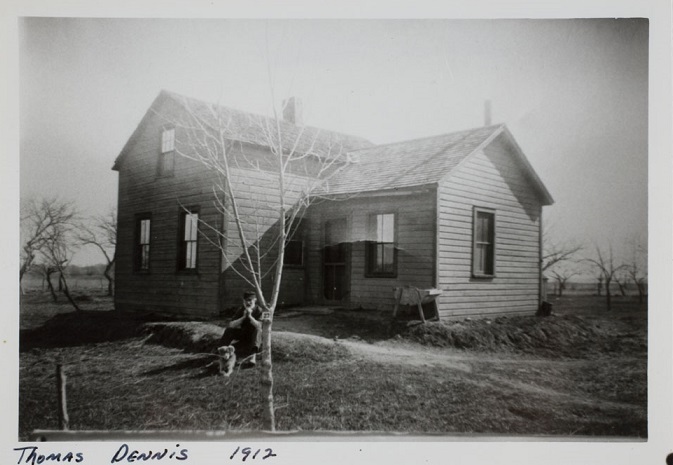 George Henry Denniss was born circa 1870 at Peckham, Surrey, England.1,2 He lived in 1881 at Camberwell, London, England; Age: 11Relation: Son.1 He lived in 1935 at Rural, Cayuga, New York, USA.2 He lived on 1 April 1940 at Montezuma, Cayuga, New York, USA; Age: 70Marital Status: Married; Relation to Head of House: Head.2 He died on 6 May 1956 at Auburn, Cayuga, New York, USA. (?) Cochrane married Florence Dennis, daughter of John Denniss and Mary Ann Leggett. Jane (?) married Robert Louis Damewood, son of Louis Damewood and Florence Elizabeth Dennis. [S69] 1940 United States Federal Census, online , Year: 1940; Census Place: Throop, Cayuga, New York; Roll: T627_2508; Page: 7B; Enumeration District: 6-79. Sarah Dennis was born circa 1828 at England.1 She was born circa 1835 at England. She married Thomas Dennis, son of Thomas Denniss and Rebecca Gill. Sarah Dennis lived in 1880 at Montezuma, Cayuga, New York, USA.2 She died on 19 August 1898 at Montezuma, Cayuga, New York, USA. [S6] Ancestry.com, 1850 United States Federal Census (n.p. : Online publication - Provo, UT, USA: Ancestry.com Operations, Inc., 2009. Images reproduced by FamilySearch.Original data - Seventh Census of the United States, 1850; (National Archives Microfilm Publication M432, 1009 rolls); Records of the Bureau of the, unknown publish date), Year: 1850; Census Place: Owasco, Cayuga, New York; Roll: M432_483; Page: 163B; Image: . [S2] 1880 United States Federal Census, online , Year: 1880; Census Place: Holly, Oakland, Michigan; Roll: 598; Family History Film: 1254598; Page: 156D; Enumeration District: 255; Image: 0754. [S26] 1900 United States Federal Census, online , Year: 1900; Census Place: Saint Vrain, Weld, Colorado; Roll: T623_130; Page: 13A; Enumeration District: 196; FHL microfilm: 1240130. [S939] Ancestry.com, Web: Colorado, Find A Grave Index, 1861-2011 (n.p. : Online publication - Provo, UT, USA: Ancestry.com Operations, Inc., 2012.Original data - Find A Grave. Find A Grave. http://www.findagrave.com/cgi-bin/fg.cgi: accessed 5 August 2011.Original data: Find A Grave. Find A Grave. http://www.findagrave.com/cgi-b, unknown publish date). [S6] Ancestry.com, 1850 United States Federal Census (n.p. : Online publication - Provo, UT, USA: Ancestry.com Operations, Inc., 2009. Images reproduced by FamilySearch.Original data - Seventh Census of the United States, 1850; (National Archives Microfilm Publication M432, 1009 rolls); Records of the Bureau of the, unknown publish date), Year: 1850; Census Place: Mentz, Cayuga, New York; Roll: M432_481; Page: 112B; Image: . [S1] 1870 United States Federal Census, online , Year: 1870; Census Place: Owosso Ward 1, Shiawassee, Michigan; Roll: M593_; Page: ; Image: . [S95] Unknown author, Michigan Death Records Online, Url: http://www.mdch.state.mi.us/pha/osr/gendisx/index.htm (n.p. : n.pub., unknown publish date), Death Certificate Image. [S1] 1870 United States Federal Census, online , Year: 1870; Census Place: Carrolton, Saginaw, Michigan; Roll: M593_; Page: ; Image: . Find A Grave Memorial# 60884908. [S963] Ancestry.com, Web: Brooklyn, New York, Green-Wood Cemetery Burial Index (n.p. : Ancestry.com Operations, Inc., unknown publish date). [S26] 1900 United States Federal Census, online , Year: 1900; Census Place: Syracuse Ward 8, Onondaga, New York; Roll: T623_1136; Page: 9A; Enumeration District: 109; FHL microfilm: 1241136. [S6] Ancestry.com, 1850 United States Federal Census (n.p. : Online publication - Provo, UT, USA: Ancestry.com Operations, Inc., 2009. Images reproduced by FamilySearch.Original data - Seventh Census of the United States, 1850; (National Archives Microfilm Publication M432, 1009 rolls); Records of the Bureau of the, unknown publish date), Year: 1850; Census Place: Athens, Bradford, Pennsylvania; Roll: M432_756; Page: 301A; Image: . [S9] Ancestry.com, 1860 United States Federal Census (n.p. : Online publication - Provo, UT, USA: Ancestry.com Operations, Inc., 2009. Images reproduced by FamilySearch.Original data - 1860 U.S. census, population schedule. NARA microfilm publication M653, 1,438 rolls. Washington, D.C.: National Archives and Records, unknown publish date), Year: 1860; Census Place: Barton, Tioga, New York; Roll: ; Page: 534; Image: 538. [S779] Ancestry.com, Web: Pennsylvania, Find A Grave Index, 1681-2012 (n.p. : Ancestry.com Operations, Inc., unknown publish date). [S26] 1900 United States Federal Census, online , Year: 1900; Census Place: Syracuse Ward 8, Onondaga, New York; Roll: 1136; Page: 9A; Enumeration District: 0109; FHL microfilm: 1241136. Harriet M (?) married John B Chase.